The author was stationed in South Vietnam for almost three years—from September 1966 through June 1969. While there he earned the rank of Staff Sergeant E-6 and awarded the Army Commendation Medal by the Secretary of the Army Stanley Resor. Shortly after being discharged from the Army, in August of 1975, he was appointed to the Teaneck Police Department as a law enforcement officer. During his police career, he attended Fairleigh Dickenson University’s where he earned an Associate in Arts Degree with honors. He has completed training programs at many law enforcement educational facilities such as John Jay College of Criminal Justice, the NJ State Police Training Academy and the New England Institute of Law Enforcement and Management (Babson College). In addition to his educational accomplishments, he is a certified State of New Jersey Police Training Instructor. When he first started his investigative journey into Agent Orange, he never suspected what he would discover. The deeper his exploration took him, and the more he saw all the lives which had been taken and damaged by the rampant use of pesticides during the war; the more determined he became to try to set the record straight. So, starting with the death of his friend and fellow veteran, Larry White the concept for Silent Spring - Deadly Autumn of the Vietnam War was born, and a reluctant writer emerged out of sheer exasperation and sorrow. For the rest of the world, the Vietnam War is over. For the soldiers who fought in it, no matter what their role, it will never be over. Silent Spring: Deadly Autumn of the Vietnam War is described by author and Vietnam veteran Patrick Hogan as “part memoir, part exposé, and part call to action against the bureaucratic and legislative negligence and indifference that has violated, and continues to violate, the trust of veterans and US citizens as a whole.” Succinct and well put, this is the perfect description of a horrific cover-up, one of the greatest crimes against humanity of the 20th century, and one that, had it happened today, would have been labelled genocide. The author served two years, nine months and 22 days in Vietnam and that was enough to poison his body to the extent that he ended up with a laundry list of ailments. These only manifested 43 years after his service ended, but confirmed Patrick’s conviction that his time in Vietnam and his numerous illnesses were linked. After all, on many occasions, among the reasons cited by medical experts for his problems were the two chilling words “environmental agents.” And thus began his exhaustive and minutely detailed investigation into the witches’ brew of potentially lethal tactical pesticides which he is sure contributed to the decline in his health and that of many other veterans. Sidelined and pushed from pillar to post, Patrick came up against the stone-walling tactics of the Department of Veterans Affairs (DVA) and the US government, both of which deny the effects of the toxic chemicals Vietnam veterans were exposed to during the war. The reasonable person wonders why the government and chemical companies did not set about covering medical bills and compensating these men. The answer is simple. Money and greed. The refusal of the DVA and the US administration to accept responsibility is to protect them from international liability and accusations of use of chemical warfare/weapons (which is the case) and to avoid the massive payouts they would be forced to make. This is a shameful indictment of the political administration of the time, and the current one, when reparations could but won’t be made. I had a vague idea of the Vietnam War when I picked up this book, and of course I had heard of the infamous Agent Orange, a horrifying and deadly herbicide and defoliant chemical used to destroy jungle cover for the enemy and any food supplies they might locate there. The US government destroyed millions of acres of South Vietnam jungles. It was an environmental catastrophe beyond any natural disaster ever known. I had never heard of Agent White and the numerous other toxic and deadly concoctions, a chemical poisonous soup, used as pesticides. Vietnam is home to myriad insects, bugs, and critters all carrying their own types of bites, stings and diseases. They had to be exterminated. The problem was that daily exposure to these poisons inevitably altered the molecular structure of the cells of people exposed, but took years, even decades, to manifest. This gave the government and the DVA enough wiggle room to claim inconclusive evidence and to fudge the facts and manipulate the statistics. Despite the mind-boggling details and chilling statistics contained in this memoir, the author has no moments of self-pity. He includes very detailed research, scientific, chemical and medical information, but all in a very readable, user-friendly style. I felt as if I were sitting with the author and chatting over coffee. He manages to intersperse facts and figures with events in a way that makes it easy to absorb the statistics and the information which is so relevant to his story. Photographs are an added bonus to help the reader visualize the location and the living conditions of the men who served in Vietnam. The facts are thoroughly researched with bibliographic and reference end notes to give credibility to Patrick Hogan’s story, one of tragedy shared by many, many other soldiers who gave their lives in a war that should never have been fought. Very impressive and highly recommended. As a reviewer, in the past few months I’ve had the opportunity to read several books, usually memoirs, penned by vets of the Vietnam War. Every one of them has been an enlightening and heart-wrenching read. Some of these vets have written graphic details of what they witnessed and endured while doing their “duty”. Others have focused on the battles they have continued to fight with PTSD after returning home. But Silent Spring: Deadly Autumn of the Vietnam War by Patrick Hogan is the first memoir I’ve read that zeroes in on the ongoing battles a countless number of these vets continue to fight even 40 years later: the killer battles with their health, and with the DVA, EPA and various US Health Departments to receive some kind of compensation after being, as Hogan calls it, “treacherously betrayed”. Patrick Hogan writes passionately, but for the most part, conversationally. We meet him initially through his own story of suffering, primarily with health issues that began almost immediately after returning from service, but for which doctors could find no specific cause. Now, decades later, with so many vital organ parts having been removed, coupled with endless rounds with heart trouble, COPD and so much more, Hogan has narrowed his critical health issues down to his exposure to Agents Orange and White and various other chemical pesticides and insecticides sprayed by the US on Vietnam crops and jungles. There can be no question that these sprays eventually made their way into the troops’ bodies via their own food and water, not to mention while showering under a chemical soup at the end of a day. To support his thesis, Hogan has extensively researched his subject, supplying pages of references at the end of the book. He includes copious lists of the chemicals in these sprays, and details their effects on all living organisms. This information makes readers shudder with disbelief and revulsion, especially in learning from documents Hogan supplies that though it is consistently denied, the US government was indeed aware of the possible dangers to life in using these chemicals. But at the same time, no extensive testing had been done ie. these vets were, in a sense, guinea pigs. So now, years later, vets are suffering and dying from a multitude of illnesses, similar in each of them. Hogan himself has, for too many years, been fighting the Veteran's Administration over service-connected disability issues. This struggle has finally secured him 80% service-connected disability. But what of all the others who have died fighting a battle they can’t win with their health? Hogan’s intention in writing Silent Spring: Deadly Autumn of the Vietnam War was to enlighten readers about these atrocities. But as he closes his thesis, he alerts readers to another simple truth: many of these same chemicals are still being used in our everyday lives, our homes and gardens today. Oh sure, the EPA and departments of health and agriculture are a lot more diligent in their testing today…or at least we have to hope so. But how do we know what the long-term effects will be to any such exposure, not to mention the chemicals in prescription drugs, etc? Just this morning, I got notice of worldwide recall of a blood pressure medication (Valsartan) I’ve been using for decades because of some chemical in it that can cause liver cancer. Between all the pollution in the air, the chemicals in our genetically modified foods, our drugs, and the rest, what hope do we, or our children and their children have of living a disease and illness-free life? Dream on. Thanks for writing this important book, Patrick Hogan. Silent Spring: Deadly Autumn of the Vietnam War is a nonfiction memoir written by Patrick Hogan. While many Americans considered the Vietnam War to finally be over with the fall of Saigon, for countless in-country veterans and their families, the War is still definitely not over. They’ve been battling with the DVA, the US Government and the Department of Defense now for decades in an attempt to get coverage and compensation for the illnesses and injuries received as a result of the highly toxic herbicides and insecticides that were regularly sprayed in an even more deadly combination with contaminated jet fuel. Add to that the regular burning of human waste that occurred in their camps, and the stage was set for what Hogan rightly calls the biggest environmental disaster this country has ever known. Our veterans were exposed to dioxin and other substances, which are deadly in minute amounts, in the air they breathed, the food they ate, the clothing they wore. No one considered the fact that the different chemicals would combine and become even more deadly, and no one has been willing to stand up and admit to those soldiers that their suffering was indeed caused by the substances the government used. Many believe that the government is just waiting for them to all die out, but their children and grandchildren still carry the genetic ravages wreaked on the young men who went to Nam to serve their country. Silent Spring: Deadly Autumn of the Vietnam War caught my eye because Rachel Carson’s pioneering environmental science work, Silent Spring, had made such a profound impact upon me years ago when I discovered it while researching a term paper. I felt sure that Hogan’s use of that title meant he had another equally dire and important message to share with his readers -- and he certainly did. I was stunned as I read about the toxic soups that were atomized and sprayed without any regard to the boots on the ground, and I became infuriated as I learned that the toxic nature of those chemicals was already understood; that their use was callous and calculating and that the bottom line in the way the vets have been treated for decades was to save face and to protect the industries responsible for those chemicals. Worse still, they are even now trying to market many of those products in altered form for home and commercial use. Hogan’s book is impeccably researched and masterfully written. He shares with the reader his years of studies into chemicals and their actions and interactions, and he does so in a manner that is clear and easily understood by the layman. He also honestly and frankly shares his own health conditions to allow readers to understand just how much damage in-country veterans suffered and are continuing to suffer because of the environmental firestorm unleashed upon them by their own government. Silent Spring: Deadly Autumn of the Vietnam War is a call to action that everyone should read and then start asking their members of Congress to address -- while those veterans are still alive. It’s a crucially important work and it’s most highly recommended. 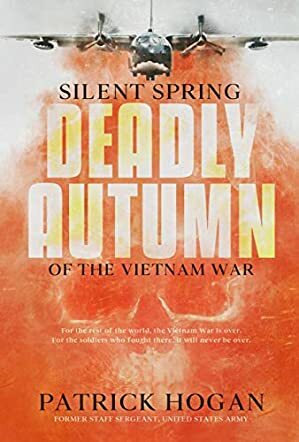 Silent Spring: Deadly Autumn of the Vietnam War by Patrick Hogan is an account of his time served in Vietnam when American troops were sent to aid the people of South Vietnam fight against the communist forces in North Vietnam. Although the war ended in 1975 with the fall of Saigon, the author argues that it is, in fact, not over, as it left a legacy carried within those very soldiers who returned to their homes in America. He recounts many, many statistics of the amounts of lethal insecticides which were sprayed to defoliate the jungle and to destroy the insect life such as mosquitoes. At the beginning of the book, the author tells us a little of what life was like during his stay in Vietnam, working in the supply unit where many of these chemicals were stored and the dangers of burning human waste and lack of pure drinking water. He mentions that his interaction with the local Vietnamese was very limited. He then tells us of the many health problems which have plagued him, beginning not long after he arrived home. He explains the correlation between the chemicals used in the spraying and the effects they have not only on the test animals in the laboratory, but also in the human body. Hogan then explains in minute detail not only what was sprayed over the countryside, but how it was dispersed and the consequences of air drift. While the world is familiar with the term Agent Orange, the author breaks down the composition of this weapon, plus that of Agent White and Malathion, all of which were manufactured with undisclosed inert ingredients and mixed with fuel oil before use. Not an easy book to read, Silent Spring: Deadly Autumn of the Vietnam War by Patrick Hogan is the result of extensive research he undertook, often from documents which have recently been released into the public domain. He exposes an extensive cover-up by the American government, still denying any responsibility for the poor health experienced by the returning veterans who were challenged to prove that their diseases were caused by the extensive use of chemicals. The author argues that this is most likely because they do not want to bear the cost of compensating the veterans’ medical expenses, plus admitting their behaviour was reprehensible in waging chemical warfare, and also claiming the studies they ordered showed that no harm was done by the military defoliation. All the evidence presented thoroughly refutes their arguments and while Hogan does give the reader easy analogies, there are pages of lists of chemicals, pages of reports and memos, and pages of medical conditions. Overall, this is more a report, a reference for future generations on the damage caused not only to the one generation of men who actually fought, but for succeeding generations who may suffer due to genetic changes passed on through birth. This book is crammed full of information and statistics that would be very useful for any group wishing to legally challenge compensation from the American government. On a personal note, I saw the horrendous pictures in the War Remnants Museum in Ho Chi Min City (Saigon) of the results of Agent Orange on the local population, maimed, killed and disfigured – it is impossible to believe any denial that these actions caused immense human suffering. Silent Spring: Deadly Autumn of the Vietnam War is a serious post-wartime memoir written by author Patrick Hogan. Set mostly in the present day, the volume explores the impact that the Vietnam War had on many of its veteran soldiers. Beyond the terrible illnesses, both physical and mental, that serving and surviving soldiers have endured since the war, Hogan specializes in the impact of concoctions of toxic chemicals which he and other soldiers were exposed to, such as pesticides, on a daily basis. The link between these chemicals and the numerous expensive and damaging health problems Hogan has had since returning from Vietnam resulted in a shocking exposé aimed right at the heart of US legislation. I found Patrick Hogan’s story to be a gripping account of living with continued trauma and disability even after serving his country in a war that might never have even needed to take place. Despite his honorable service as a veteran, or perhaps because of it, Hogan seeks justice for all those fellow survivors who now face insurmountable medical bills and difficult lives because of what they were forced to encounter during the war: namely toxic chemicals which were not properly legislated in Vietnam, and some still aren’t today. What follows is a shocking record of Hogan’s battle with this issue, alongside his memoir-style snippets of what life was really like living in these terrible conditions. Overall, Silent Spring: Deadly Autumn of the Vietnam War is a must-read for anyone concerned with environmental issues as well as veterans’ rights. Silent Spring: Deadly Autumn of the Vietnam War is a memoir by Patrick Hogan charting the shocking story of why tens of thousands of US veterans who served in the Vietnam war now suffer from debilitating health problems. For many soldiers, the war didn't end when they returned home. It continued in the form of a series of severe medical conditions which could only have been caused by the use of tens of millions of gallons of extremely dangerous herbicides and pesticides sprayed during their deployment. Not only do these people suffer severe ill health but they have to deal with the calculating bureaucracy of government organizations that are failing them on a daily basis. Declassified documents show the extent of the manipulation and cover-up by chemical companies, the military, and the government. I take my hat off to Patrick Hogan for this very well-researched book which documents the appalling treatment of Vietnam veterans. Himself a Vietnam veteran, he writes an explosive story exposing cover-ups and injustice on an extraordinary scale. This is a chronicle of the complete disregard for the health of soldiers on active duty which continues when they return home. I was impressed with the volume of information provided on the cocktail of highly dangerous chemical sprays, including the notorious Agent Orange. Patrick well and truly lifts the lid on the whole sordid affair. Silent Spring: Deadly Autumn of the Vietnam War is an absorbing book which helps us to understand what really happened in the Vietnam War and why so many veterans continue to suffer in its aftermath. This is a must-read for all Americans.